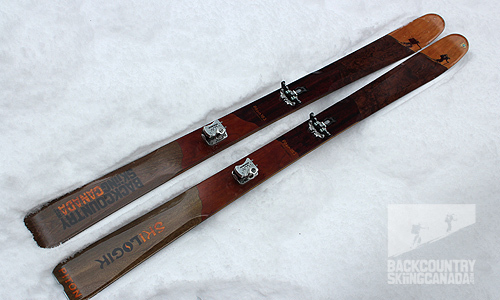 One of Backcountry Skiing Canada's 2013 'Gear of the Year' award winners was the Skilogik Yeti skis. The Yeti skis blew away all my expectations due to their light weight and ski anything personality. It was therefore hard for me to imagine how such an effective all round ski that mastered the backcountry and yet was still able to confidently ski the resort could be improved upon. At just 3300 grams per pair the Skilogik Yeti skis are one of the lightest skis on the market given their 105mm waist. To improve this ski’s prowess as a dedicated backcountry ski the only logical area to tinker with would be the weight. 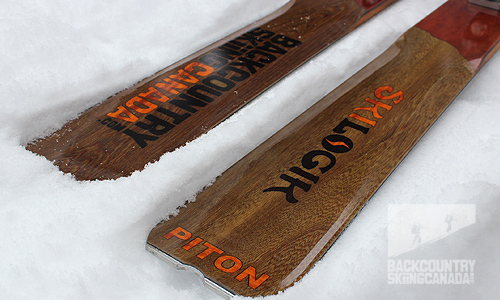 Enter the Skilogik Piton Skis. The Pitons are 100 grams lighter than the Yetis thanks to the tips, waist and tail being 9mm, 11mm and 6mm narrower, respectively. This size reduction accounts for most of the weight savings since aside from this the Skilogik Pitons appear to be identical to the Yeti skis, which is a good thing. Skilogik’s line-up of skis is not limited to just backcountry models. They currently have18 different models of skis categorized into seven categories: Race Room, Twin Tips, Women's, Park Skis, Backcountry, Rocker Logik and Rocker/Rocker. Our Pitons came with a custom top sheet design with our logo emblazoned at the tips and tails. You too can have your own personal ski just ask Skilogik how. 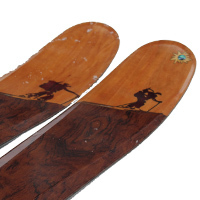 Like the Skilogik Yeti Skis, the Piton Skis use a sandwich construction that employs a solid hard wood core with black locust sidewalls for durability. This core is sandwiched between two layers of Vektor 8 Carbon Fibre to provide torsional rigidity. On top there is the wood veneer inlay and finally the Clear Iron coating which protects the top sheet from damage. On the underside, Bomb Proof edges are used along with a layer of Vulcanized Rubber and finally a Black Magik sintered base which provides great glide and durability. To finish things off the Piton’s tail has a machined aluminum tail bumper with an integrated skin notch so that your skins stay in place. Generous amounts of camber under foot. Slight early rise to provide float in powder. A slight rise on the tails allows you to back up if needed on the ski track and the Aluminum tail bumper keeps wear to a minimum. 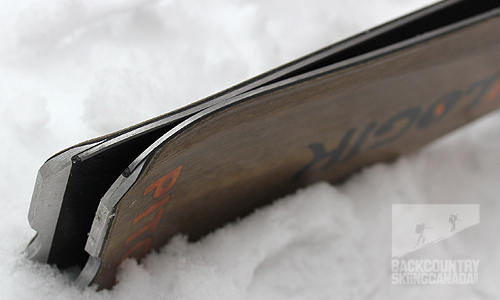 - At least 95% of the wood used in making each pair of Skilogik Piton skis is sustainably harvested. - For every pair of Piton skis produced, Skilogik makes a donation to plant a tree in a reclaimed Atlantic Rainforest in Brazil which helps off-set the carbon dioxide produced in making the skis. 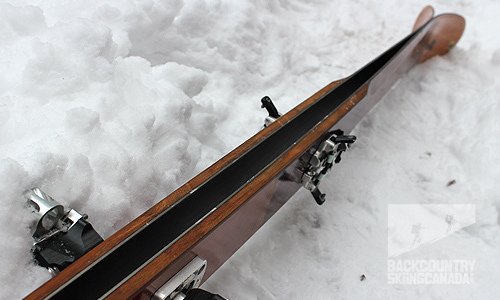 - The skis are made with a solid wood core with two layers of Vektor 8 Carbon Fibre. - Aluminum tail bumper with skin notch. 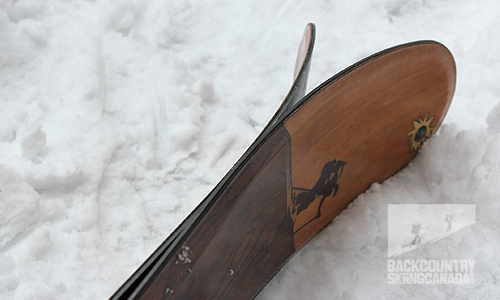 - A closer look at the unique wood laminate top sheet which can be customized to your design as we have done here with our Backcountry Skiing Canada logo. I mounted the Skilogik Yeti Skis with the Plum Guide Bindings which are a light weight tech binding made of aerospace grade aluminum material. 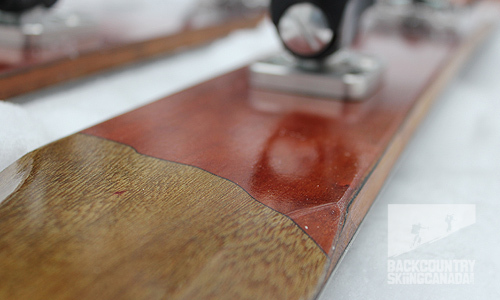 The heel piece of the Plum Guide Binding can be rotated in both directions to achieve the desired heel lift. There's also a 15mm distance between the ski boot and the top of the ski which allows for a natural flex and eliminates the 'dead spot' between the toe and heel piece. 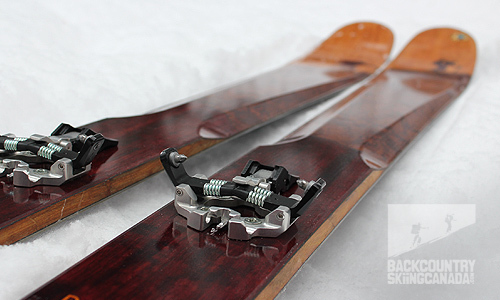 The mounting pattern of the Plum Guide Bindings is 100% identical to the (non race) Dynafit touring bindings so no need to re-drill those skis if you are looking to change brands, easy-peasy. The Plum Guide bindings retail for $620 CAN and weight in at 22.65 oz / 670g (per set w/o screws), the DIN range is from 5.5 to 12. I have long applauded Skilogik’s unique approach to ski manufacturing. Not only do they produce beautiful skis with custom top sheet designs (as they did for Backcountry Skiing Canada), they also consider the environmental impact of their actions and try and off set these as best they can. 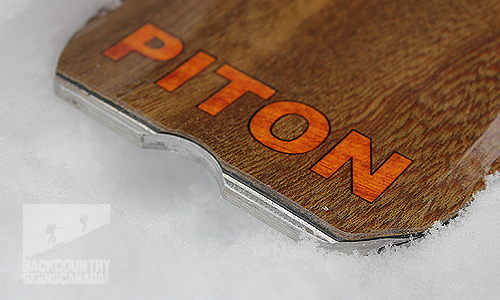 Beauty, however, is only ski deep as they say, so how does the Piton ski? While ski touring over the past month we have encountered less than typical snow falls here in the Kootenays so it provided a great opportunity to discover if the Piton was a true chameleon that could tackle any conditions or a one trick pony. On powder days in the backcountry the Piton performed exceptionally well, especially given its leaner dimensions when compared to the Skilogik Yeti skis. When the snow got really deep on a few occasions one could easily miss the 10mm of girth that the Yetis provided to keep you floating on top of the powder. However if you are from the Rocky Mountains the Pitons would be right at home in the continental snowpack. On hard pack and groomers the Skilogik Pitons proved more challenging to drive through turns and hold a good carve. Their lack of weight allowed them to get pushed around and skittish chatter was not uncommon. I was not expecting the Piton to provide high performance responsive turns at the resort as it was not designed for this after all. The Piton is at home in the backcountry where its weight and dimensions provide effortless skinning and fun floaty turns in the soft stuff. If you expected a ski that weights less than a 6-pack to provide stability in all terrain then you will be disappointed. If you are after one of the lightest dedicated backcountry skis on the market that performs well in modest amounts of powder and crushes multi-day traverses then the Piton is for you. Combine the Skilogik Piton skis with the Plum Guide Tech Bindings and you have an über light set-up that allows for big days of vert. As stated above, the main difference between the Pitons and the Yetis is the 100 gram weight difference. Is the weight savings worth it when we know that the Yetis are a more versatile ski? I would say that if you ski powder more often than not, then no it is not worth it. If, however, you plan on having big days, long traverses or ski in an area without as much powder then yes, it is definitely worth it. Have a look at the other Skilogik reviews we have prepared including the Skilogik Howitzer Skis, the Skilogik Yeti Skis which were awarded our coveted Gear Of The Year Award, and the Skilogik Ullr’s Chariot BC Skis. The Piton’s thickness is minimal at the tip and tail and beefs up underfoot where binding mounts are required.